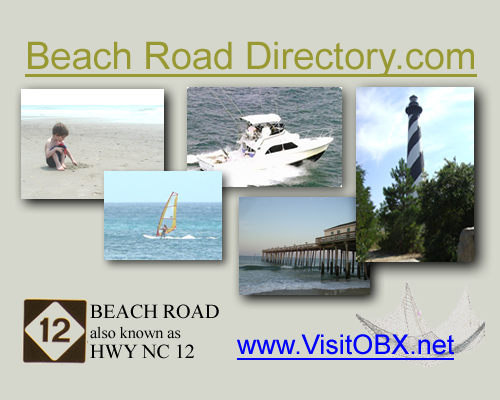 Outer Banks (OBX) Directory of Places to Hotels, Motels, Lodging, Camping, Restaurants, Charters Fishing, Souvenir Shops and more. Beginning in Corolla, North Carolina (near the Currituck Beach Lighthouse), NC 12 (also known as "Beach Road") travels south along the Bodie Island shoreline through the cities of Duck, Southern Shores, Kitty Hawk, Kill Devil Hills and Nags Head before entering the Cape Hatteras National Seashore. Beach Road (NC 12) then passes the Bodie Island Lighthouse just before crossing over Oregon Inlet to Pea Island, Rodanthe, Waves, Salvo, Avon, Buxton, Frisco and Hatteras. Further south, Beach Road continues after boarding a free ferry to Ocracoke Island, home of the Ocracoke Lighthouse. Lastly there is a toll ferry to Cedar Island to U.S. Highway 70 near the historical town Beaufort, NC.